The Planting Calendar in bio-dynamic farming is about the natural rhythms of the cosmic solar/lunar (Moon rhythms) and Earth rhythms. These are the rhythms that sustain life on our home-planet Earth. There are 6 different rhythms that occur every 27-29 days. This rhythm is easy to see. It starts from a new moon to a full moon. It is when the new moon is away from the Sun and is completely invisible. After 7 days, it reaches the first quarter. This is the time when the moon is half bright and half dark. 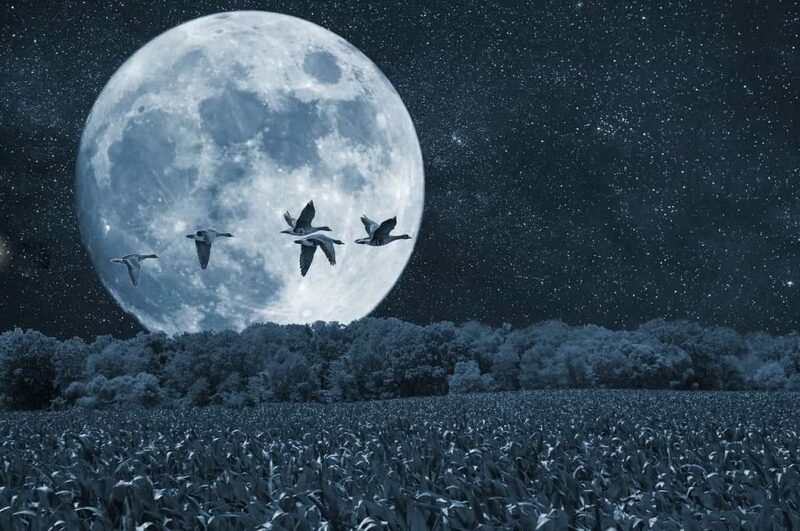 The full moon is 12 times brighter than the first quarter. After approximately 29.5 days, the rhythm begins again. The element which is the most affected during this time is water. In the 48 hours leading to the full moon there appears an increase in the content of the moisture content of the Earth. The growth forces of the crops seem to be increased. Seed germination may be soft and resistant to fungus attack. The forces of full moon provide favorable conditions for the growth of fungus on all plants. There is an increase in insect activity like snugs and snails, and internal worm parasites in humans and animals. The full moon forces allow in the absorption of liquid manures. There is a chance of raining at a full moon day time. During the new moon period there is more underground activity in the soil and the flow of sap in the plants is less strong. Therefore, it is a good time for turning under green manure and cutting hay. This is the time when the moon and Saturn are on the opposite sides of the Earth and their forces are coming into the Earth from the opposite sides. This occurs every 27.5 days. The moon forces bring calcium processes which are connected to propagation and growth forms. The Saturn forces bring in the silica processes, which are connected to the building up bulk in the root, leaf and fruit. These two forces streaming into the Earth produces very strong plant form seed sown at this time. Spray BD preparation BD 501 (horn silica) in the early morning or before the day of this rhythm. Spraying horn silica during this time improves the taste of fruits and vegetables. The daily path of the moon across the sky is not always the same. Sometimes it is higher in the sky, and sometimes it is lower. The Sun also follows an ascending, descending rhythm when it passes through the Zodiac every year. The moon takes only 27.3 days to pass through the Zodiac. When the moon moves from East-West, it is called the ascending period of the moon and when the moon moves from West-East, it is called the descending period of the moon. The moon takes 27.3 days to complete this cycle in which the ascending period is for 2 weeks and the descending period is for two weeks. Rudolf Steiner considered Earth as a living organism that inhales and exhales. He relates the ascending and descending moon periods to the inhaling and exhaling cycle of the Earth. Due to the ascending period, the cosmic forces work above the rhizosphere and it is suitable for foliar application, propagation activities, sowing and harvesting. Due to the descending period, the cosmic forces work below the rhizosphere and it is suitable for compost application, transplanting, land preparation and harvesting of root crops. As the moon ascends and descends, it crosses the path of the Sun (the ecliptic). The crossing points are called nodes, and are the places where eclipses occur. The moon takes 27.2 days to complete the nodal cycle. So there is a node approximately every 14 days. Astronomers can calculate and tell the exact time at when a node will occur. The time of the moon nodes is also shown in the Planting Calendar. The force of the moon nodes lasts for approximately 6 hours before and after the exact time of crossing. Avoid doing any agriculture work during this time. The moon moves around the Earth in an elliptical orbit. The nearest point of the moon to Earth is known as Perigee and the furthermost point is known as Apogee. This cycle occurs every 27.5 days. At Perigee, the time at which the moon is closest to the Earth brings moisture to the Earth and it will also help in the growth of fungus and insect attack. There is an increase in the moisture content as the perigee occurs near a full moon day, which also increases the moisture content. Many researchers and farmers have found that apogee is the best for planting potatoes as the potatoes are multiple in number. During the perigee period the potatoes are less in number but the size is bigger. Apogee and Perigee times bring a stress period and planting of any plant should be avoided except potatoes. The Zodiac is a belt of constellations. The path of the stars lies behind the ecliptic path of the Sun. All the planets and the moon, move in front of the Zodiac. The moon takes 27.3 days to pass through the Zodiac. As the sizes of the Zodiac constellations are unequal, the moon stays in front of the constellation for a shorter or longer time, approximately between 1.5 to 3.5 days. Rudolf Steiner taught that every Zodiac constellation radiates favorable conditions to the plants, which the moon focuses when it passes through the Zodiac constellation. The forces of the constellations are passed on, by the reflection of the moon, through the 5 classical elements of nature which required by the crop to grow. These are – Warmth, Light, Air, Earth and Water. He studies in Class 5 at Delhi Public School – Bopal(DPS Bopal Ahmedabad), he love to explore the nature and the space. Very good written story. It will be useful to anybody who usess it, including myself. Keep doing what you are doing – looking forward to more posts. Very Good article dear Himanshu..Go ahead. I am glad that you found the post helpful.